The next thing we thought of: How can we help? We called David and learned that he had to rush to relocate 41 of his nearly 100 locations, which held about 2,200 of his 5,200 hives. Since he moved those hives, 14 of the 41 locations are now covered with lava. David also lost one location – about 130 hives – in the devastated Leilani Estates area, which was destroyed by the lava flow. While Mother Nature knows best, there’s no arguing that the lava flows are wreaking havoc on the current ecosystem. Many of the areas devastated were vital food sources for David’s honeybees. Unique fruits and, consequently, unique honey flavors were often harvested there – lychee, longan, coffee plants and macadamia tree. David is currently in the process of trying to find new locations. And, with a little ingenuity and some extra help, his honeybees should be happily producing honey and pollinating again soon. We have lots more Hawaii stories to tell, and you can read them in our upcoming special edition of HIVE! It’s free and it’s delivered right to your email inbox each month. Sign up at SiouxHoney.com. Our “Share Sweetness” initiative in Hawaii, including food bank partnerships, honey donations and ongoing fundraising efforts to support those affected by the lava flows. An overview of how the Kilauea eruption has affected the ecosystem on the island, including the destruction of vital food sources for honeybees. 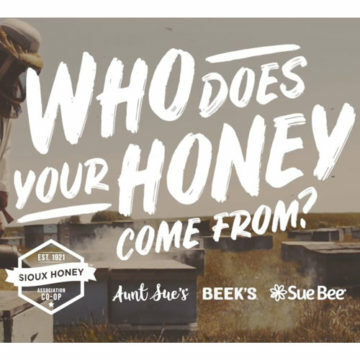 An interview with David, who talked to us about his move to Hawaii six years ago from Louisiana and the difference between being a Sioux Honey beekeeper on the mainland and producing honey in Hawaii. Interviews with local farmers who rely on David’s honeybees to pollinate their crops – from native fruits like lychee and longan, to coffee plants and macadamia trees. Interviews with honeybee researchers who are working with David to develop of a breed of bees that are resistant to fatal Varroa hive mites.